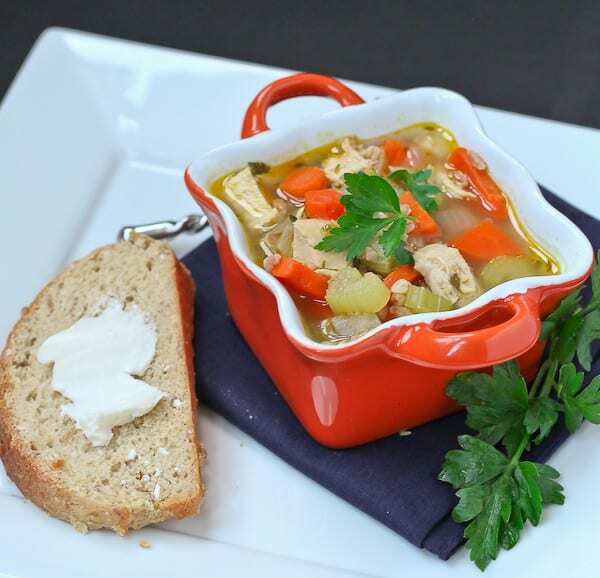 Chicken Soup with Farro and Vegetables – an easy, healthy and filling weeknight meal. You’ll love the texture of the farro in this soup. Here in Michigan, it has been collllllllllld. Winter has arrived in full force. This of course means I’m craving lots of warm soups and stews. Nearly all my soups turn out more like stew — we like them thick. Less broth, more of the good stuff. If you have a guy in the house who might raise an eyebrow about eating soup as a main course – just make it super thick and full of great protein. He’ll be happy and full – on soup alone! As I mentioned earlier this week, I often buy and roast bone-in chicken breasts (I get the big ol’ family pack of them). Once they are roasted and cooled, I’ll shred them. Sometimes I keep the shredded chicken in the fridge but most often, I throw it into zip-top bags and freeze it. It makes for simple meals when I don’t really know what I’m going to cook. Just the other day, Ben came home from work for a few minutes before jetting back to work for an evening event. He was going to grab Subway on the way back to work but he had a bit of a sore throat. So I convinced him to eat a quick dinner before he left again. 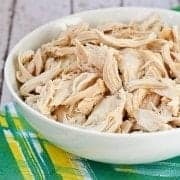 I grabbed a bag of frozen shredded chicken out of the freezer and using that, I had homemade chicken noodle soup on the table in under 30 minutes. And he said his throat felt the best it did all day. The powers of homemade chicken noodle soup, my friends. Instead of noodles, for this soup I used farro. Farro is a grain — I’d describe it as similar in texture to barley. I often use barley for a soup (see my chicken barley soup with kale and butternut squash) like this but I switched it up for farro this time. Chicken soup for the soul. Enjoy! If you love this, you’ll also love Instant Pot Chicken Noodle Soup. Heat oil in large pot over medium-high heat. When oil is hot, add onion, carrots, and celery and season with salt and pepper. Sauté until softened, about 5 minutes. Add chicken, thyme, bay leaf, parsley, broth, and water. Bring to a boil. Add rinsed farro and return to a boil. Reduce to a low boil, cover and cook for 15 minutes or until farro is tender. Taste for seasonings. Add salt and pepper as necessary. Add water if it has become too thick (we love ours super thick, more like stew). Verdict: Loved the farro in this chicken soup. Will definitely be making it again. Husband’s take: Chicken soup with farro. I’m sure his first thought was “What in the world is farro?! ?” But he loved it! Changes I would make: None are necessary but I’m always throwing in whatever vegetables I have in the fridge. Craving more soup? Try slow cooker minestrone (with quinoa! ), creamy tomato soup with whole wheat orzo, roasted cauliflower soup with cheddar, 20 minute Italian turkey, bean and spinach soup (a reader favorite!). Or if that isn’t enough, you can check out my entire archives of soup and stew recipes. Still can’t get enough soup to get that chill out of your bones? 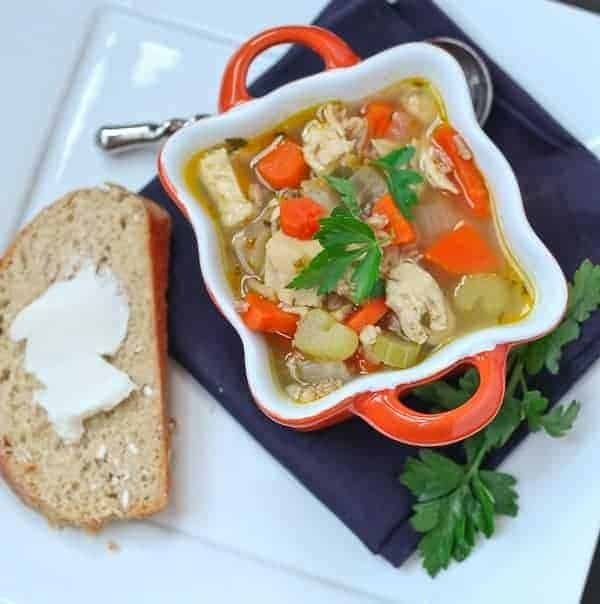 Find more ideas on my Soups and Stews Pinterest board! 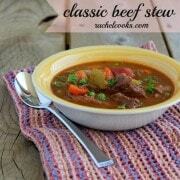 Follow Rachel Cooks | Rachel Gurk’s board Soup and Stew Recipes on Pinterest. 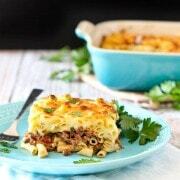 Have you ever tried this recipe in the slow cooker? How would you adjust it, if you did? I have not, but I think it would probably work great! I haven’t tried it but it would probably work. Let me know if you try it! I think the farro will take 2-3.5 hours to cook in the slow cooker, but like I said, I haven’t tried it so I can’t make promises. I’d love to hear how it turns out if you do it! I actually have a bag of unopened farro in the cupboard that I had no idea what to do with. I love barley, so I’m excited to try it now! We eat all the soup in the winter! Farro in soup is such a great variation! Pinned! It’s been getting all sorts of cold here too..and I actually have yet to make ONE SINGLE SOUP! But, this looks like THE place to start. Loving that farro! Pinned!